So maybe you've seen someone use the term BTFO on social media or in a text message and have no clue what it means. It's not exactly one of the most popular online acronyms, but it's certainly becoming more widespread as people look for faster and easier ways to get their point across in across in a message. Yes, both meanings contain the F-word. And yes, because there are two possible meanings, it can be a little confusing to figure out which one is being used when you spot it somewhere online or in a text. It's not quite clear which meaning is more popular or used most often, so you'll have to do some investigative work to figure out which meaning is being used in the messages you're reading. Keep reading to find out how. It's pretty obvious that back the f*** off is just a more vulgar way to simply say, "back off." It's what you say when you want someone to stop what they're doing because you really don't like it. As with many internet slang terms these days, however, adding the F-word adds a certain sense of intensity to the message. So whether you want to communicate how annoyed you are about someone coming on too strong or express that you feel victimized in some way, saying BTFO can get the message across about how you feel in a very quick and simple way. Examples of Using BTFO to Convey "Back The F*** Off"
"Whoever has been standing at my door ringing the doorbell for 5 straight minutes really needs to BTFO." "I wish I could tell my BAE to btfo when the game is on." "BTFO of my DMs because I ain't got enough time to answer them all." Blown the f*** out is a more vulgar way to say that someone has been beat or "blown out" by someone else in some kind of competition. It might be a sporting event, a video game, a cake-eating contest or anything else that could be seen as having a winner and a loser. This particular interpretation of BTFO tends to be used more often when one person (or team) has beat another by a significant degree. You wouldn't typically use this acronym if one person or team beat another by a small or average number of points, goals, etc. Examples of Using BTFO to Convey "Blown The F*** Out"
"The Capitals were BTFO by the Penguins last night!" "BTFO by Smithers with only 10 seconds left on the clock!" "All this rain and wind got my hair srsly btfo." 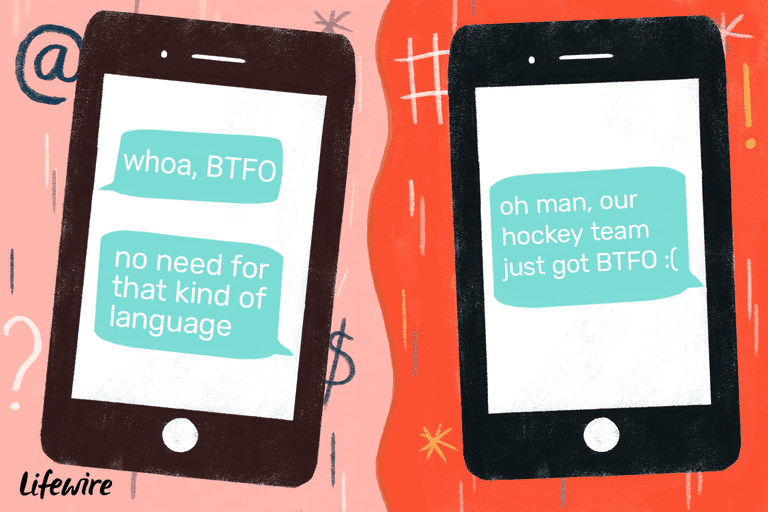 How to Tell If Someone Is Saying "Back The F*** Off" or "Blown The F*** Out"
Now that you know there are two possible ways to interpret BTFO, you're probably wondering how to determine which interpretation is being used when you come across it in a message. Here are a few tips. Read the message with both meanings to see which makes the most sense. When you see a tweet, a Facebook post, a text or any other message with BTFO in it, read it in your head or out loud with the full meaning of the acronym — first with back the f*** off and then with blown the f*** out. Context is key here. If one seems to make more sense than the other, go with it. Look for signs of victimhood expressed in the message. If the individual who typed BTFO sounds like they're offended, turned off, disgusted or just playing the victim card, they probably mean back the f*** off. Read the message a few times to see if you can sense negative emotions or a defensive reaction. Look for signs of competitiveness expressed in the message. If you can't really sense any signs of victimhood in a message that contains the BTFO acronym, look for signs of a competition being described. Does the messenger sound like they're calling someone or something a winner? A loser? If so, they might mean blown the f*** out. Ask the individual who used BTFO what they mean by it. If you simply can't figure out which interpretation of BTFO an individual is using in their message (or you simply don't want to waste your time trying to figure it out), then take the direct route by shooting them a message asking them what they meant. Remember, this acronym isn't hugely popular among everyone, so you don't have to worry about looking like someone who's out of the internet slang loop just by asking.